To do this it can test rock and coal for mechanical properties and strength by a variety of means including uniaxial, triaxial and hydrostatic loading. It is also able to determine sorption isotherms and dimensional change in coals and other sorbative reservoir rocks brought about by desorption. This work is supported by standard tests for moisture and proximate analysis of coals. 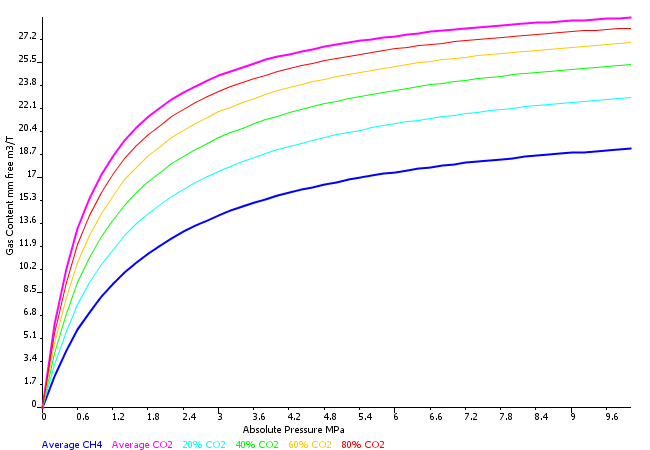 Sigra performs laboratory derived sorption isotherms on coal samples utilising pure gases (normally methane and sometimes carbon dioxide or other gas if it is present). A sample can either be provided by the client, or more normally Sigra makes up a sample to represent the seam from core supplied as part of the gas content measuring process. This sample is crushed, the moisture content determined, and the weighed sample is placed in a pressure vessel which is briefly evacuated and then filled with the test gas to a pressure greater than reservoir pressure. 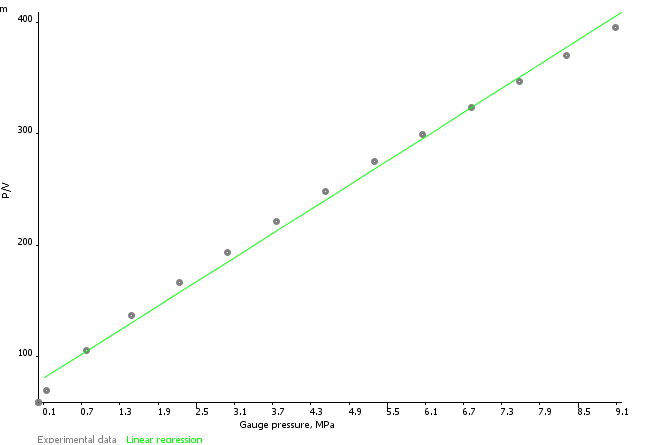 The pressure is allowed to reach equilibrium and then gas is released and its volume measured. This process is continued down to near atmospheric pressure. The process may then be repeated for a different gas type. 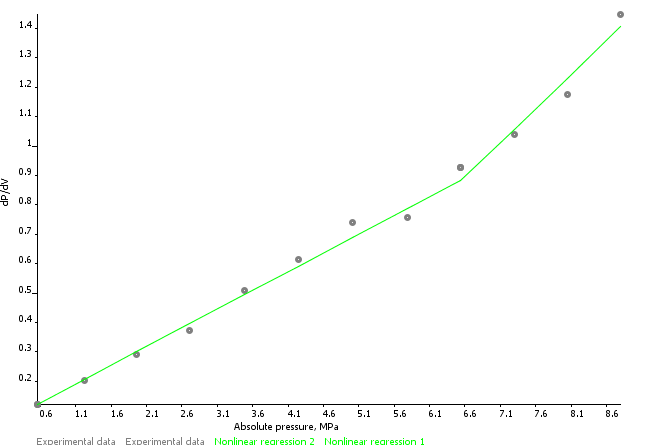 Finally helium is used in a similar manner to determine the dead volume in the pressure vessel. The vessel is then opened and a sub sample taken for moisture and proximate analysis – see below. The isotherm is analysed in terms of Langmuir and logarithmic constants on a total mass and on an ash free basis. 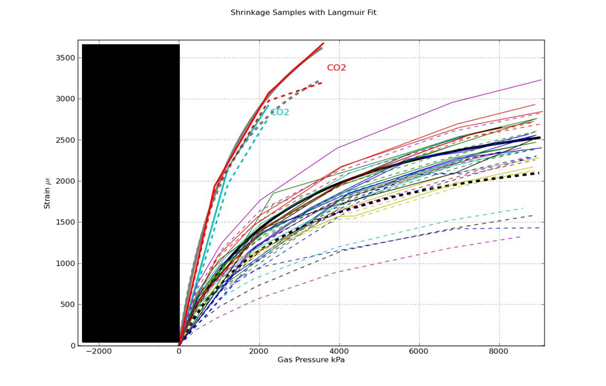 Sigra reports isotherms on the basis of the measured behaviour, a Langmuir isotherm model fit (equation 1) and a logarithmic fit (equation 2) with an error estimate based on the difference between modelled and fitted behaviour. Coal sorption behaviours may sometimes be best expressed by using one or the other model. Reports are provided on an as received and mineral matter free basis. 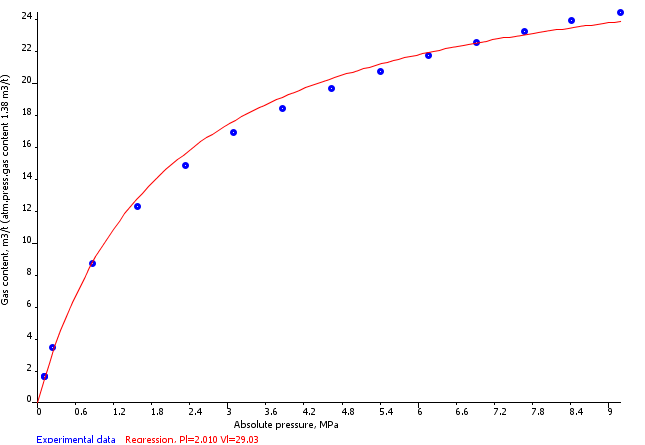 The logarithmic equation may show very clearly a change in sorption characteristic at a certain pressure whereas this cannot be deduced using the Langmuir approach. 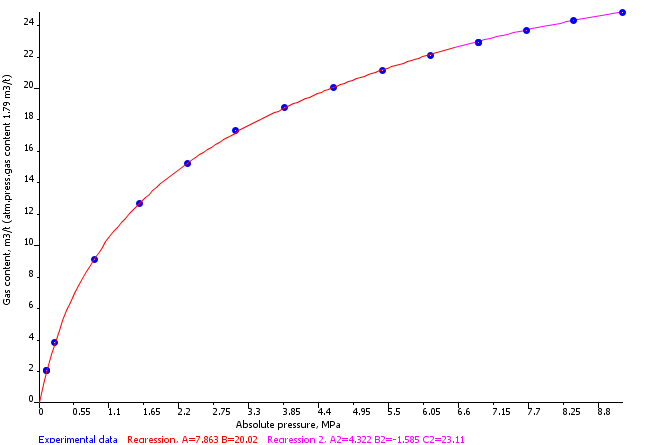 Where required, Sigra can calculate the mixed sorption isotherm of individual gas components. This calculation is based on ideal adsorbed solution theory. Dutta A. 2009. Multicomponent Gas Diffusion and Adsorption in Coals for Enhanced Methane Recovery. Master’s thesis, Stanford University. Native sorption isotherms are derived from core that is desorbing immediately after retrieval utilising the in-situ gas mixture. They therefore avoid problems associated with the mathematical recombination isotherms derived from multiple gas types. The process is to take core directly from the core barrel and to place it in a water filled pressure vessel. The vessel is then sealed and the pressure is allowed to come to equilibrium. A small amount of fluid (water and gas) is then released and its volume measured before re-sealing and allowing the equilibrium pressure to be reached again. This process is repeated multiple times until a pressure close to atmospheric is reached. Gas samples are obtained for compositional analysis. The vessel is then opened, the coal mass, volume and residual water is measured and the coal is crushed to provide a Q3 volume. Samples are normally taken for moisture, carbonate and proximate analysis. Determining a native sorption isotherm is a slow process. Mixed gas samples may take months to desorb adequately. It should also be noted that because of the initial gas loss the native isotherm will not reach the full sorption pressure of the reservoir. Sigra strongly recommends undertaking native sorption isotherm tests for all mixed compositional gas cases. The process provides a check on the combination of laboratory obtained isotherms using IAS theory. Sigra has a triaxial test rig designed to work with HQ (63.5 mm diameter) or HQ-3 (60.9 mm diameter) core. The axial stress can be loaded independently of the radial stress on the core. Radially to or from a central hole in the core. This latter process is readily conducted on core from IST stress testing. Core permeability testing is not recommended for coals as their permeability is dependent on the cleating which is usually at a spacing that is sufficiently large that a statistically representative number of cleats are not contained in the core size tested. The same applies to many shales. Sigra measures the amount of carbonate in crushed coal samples (usually from coal desorption or isotherm tests) by acid reaction and titration. The results of testing are presented in terms of mass of equivalent calcium carbonate removed. Carbonates contained in cleats may block them and restrict permeability. If the cleat carbonate can be removed by acid leaching, the amount of carbonate removed is then determined by titration of the leachate. In addition the core is examined to determine from which cleats or bedding planes the carbonate has been removed. This information can be used in combination with coal modulus and stress information to arrive at the expected de-stressing of the coal that would be achieved by solution of carbonates. This laboratory test provides information on how coal changes dimensionally with adsorption/desorption of gas. This information is required as a component of the process of determining the stress changes that a coal seam will undergo during drainage. The stress path is a key to determining how coal permeability may vary. The process of the test involves examining the core from a coal seam following desorption by Sigra. Samples are then selected which represent the various plies within the coal seam. As a general rule intact coal core is not available and fragments must be chosen. These are then strain gauged using two rosettes placed on the cleat faces and placed in a pressure vessel, which is then evacuated. Gas is introduced into this pressure vessel and held at a number of pressure steps up to reservoir pressure. A single gas type is used and if the gas composition is a mixture of more than 7% of any particular gas, then these gas types should be used individually and the results subsequently combined. In between each step the core is allowed to reach dimensional equilibrium. When the maximum pressure is reached, the core is allowed to desorb slowly in a fewer number of pressure steps to obtain confirmation of the coal’s dimensional state. The process is slow and a single gas adsorption/desorption cycle may take several months to complete. 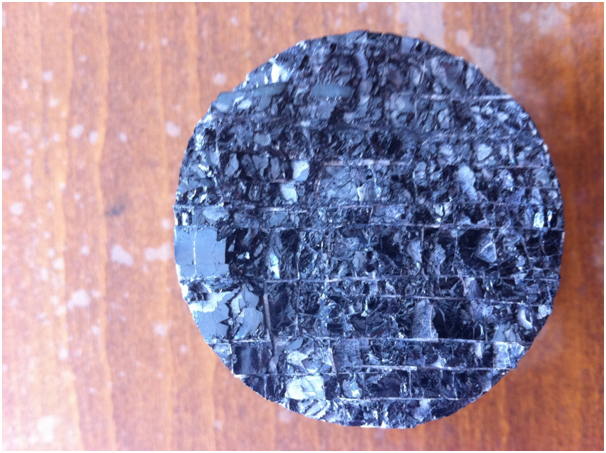 Example of the dimensional change of coal samples from a particular formation tested with methane and with carbon dioxide. These tests are performed in accordance with AS 1038.4-2006. They are provided as a standard service as part of other testing.